Floods are the most common (and expensive) natural disaster in the United States. 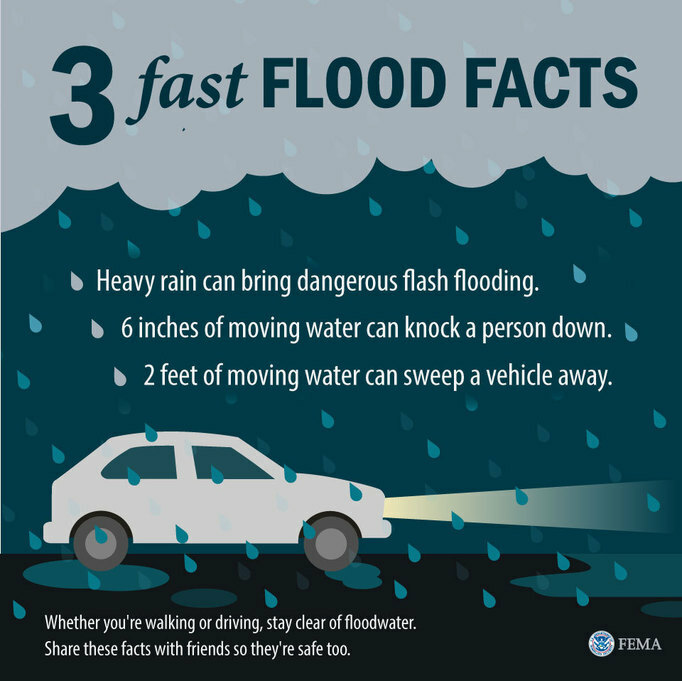 Here are some things to keep in mind as we enter the spring flood season, courtesy of the Department of Homeland Security. Never drive or walk through flooded streets. A mere six inches of moving water can sweep a person off their feet, and only a foot of rushing water can move a car. Floods bring a financial toll. A few inches of water in a 1,000 square-foot home could cost more than $10,000 in repairs, plus the replacement of personal possessions. FEMA’s data visualization website offers insight regarding the costs and impacts of floods in your state. Most insurance does not cover flood damage. Homeowner's insurance does not cover the damage from floods. Speak with your insurance agent to learn more and remember flood insurance takes 30 days to take effect. Plan ahead to protect your family. Talk with your family and make an emergency plan for you and your pets. It's always smart to have emergency supplies ready at home, at work, and in the car.